Question – What have limestone quarries in the UK’s Yorkshire and Derbyshire, and Health & Safety got in common? Answer – Apart from silicosis (which has now been addressed by wet cutting techniques), they have absolutely nothing in common. One produces a range of tough resilient building materials generically referred to as ‘aggregates’; the other produces a bland compliant uniform and weak structure. But before reaching fingers to keyboard in protest at such an outlandish comparison, please take time to consider the metaphor. From domestic paths to parking lots to free-ways to rail-roads to airport runways, something carries the punishing load imposed by the passing traffic and transfers it to the ground beneath. That ‘something’ is almost always some form of aggregate. Without it mass transport could not happen. 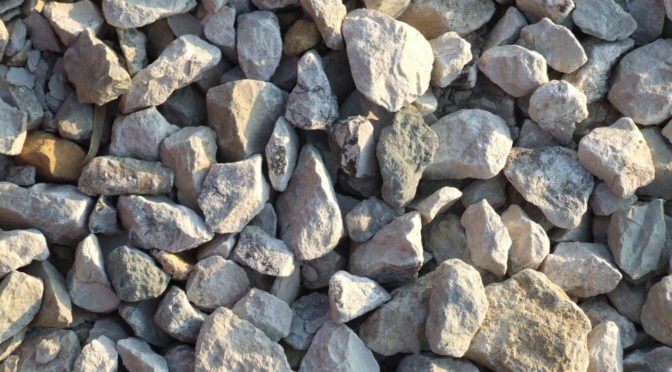 And, of course, aggregates are sourced all over the world not just from the UK’s Peak District. Compared with other composite materials like glass reinforced plastic and steel, they are cheap and unsophisticated, but they are durable. What gives them their strength is the range of particle sizes and their angular rough shape. From ‘scalpings’, which need a microscope to examine, to track ballast, which can be seen with the naked eye, the components are rough round the edges. Compare and contrast these with materials that have uniform particle sizes and the edges smoothed off. 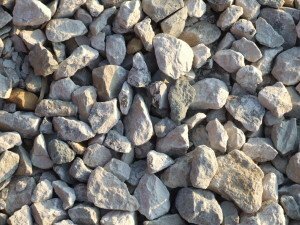 From soft sand, to pea shingle to decorative pebbles, they look good, feel smooth but are structurally weak. Indeed most forms of pure uniform material are structurally weak; without the interstitial carbon atoms in steel pure iron bends under load and does not recover. And what does the health community try to do? It trains people to think in a uniform way, it insists on compliance and it uses bland smooth language that brooks no disagreement. By analogy with smooth uniform materials it is weak. I like organisations with a variety of different people in it. I like people who are blunt in what they say and how they say it. I like the rough uncompromising Yorkshiremen with whom I went to college. Intuitively I feel safer in such communities and organisations. I think your analogy is somewhat weak. Without a a lot of preparation to establish a strong foundation the ‘domestic paths to parking lots to free-ways to rail-roads to airport runways’ would simply crumble under the loads they carry. Also those structures are built using uniform construction methodolgies – even down to the materials that are combined in precise ratios to make the finished running surfaces. Yes, there are processes for estabslihing new methodologies and material combinations but even those processes require rigourous examination of the outcome before being adopted or adapted for use in construction. Even concrete, in large pours, is tested periodically through the pour to ensure that a uniform consistency in strength and durability is established across the whole pour. Poor construction methodologies, and pour materials control, results in significant downtime and cost as the structures break up under the loads they carry. Surely then, these foundations and construction methodologies are analogous to the standardised processes that are established in managing health and safety. I agree there needs to be allowance, and even encouragement, to ‘think outside the box’ but the application of that thinking still needs to be tested before being implemented. As I’ve written elsewhere on this and other OHS blogs – even stuntmen and daredevils do a lot of work in identifying and assessing the risks, and then undergo a rigourous practice and testing process BEFORE they undertake their stunts for real. Les – thank you for the post extending the metaphor to the structures that support the sub-base . It is a conceptually good one. A good structure will support the aggregates. Admitted it was 40 ago that I was last in a structures testing lab but I remember various structures being tested to destruction. We knew the loads that could imposed on Norman arch or reinforced concrete beam or piled foundations or concrete rafts and were taught to choose the appropriate one based on comparative failure rates. Presumably the H&S structures, methodologies, techniques etc…have been through a similar testing process to find out just how robust they are? There must be some comparative data somewhere that shows just how much risk assessment actually reduces injury rates, and which is the apprpriate risk assessment method for which industry. Or am I missing something? In all my time in OHS I have not been a big fan of statistics. The only reason I have recorded and reported any is that senior managers usually require them for reporting purposes – performance against KPIs. As I’ve explained in another blog on this site, statistics don’t prove very much with regard to prevention of incidents and injuries. Lag indicators, like LTIs, LTIR and LTIFR, are the primary focus of many senior managers in Australia but all they do is tell us that our system failed and how severly it failed compared to a group of other organisations. Lead indicators can show us what effort was applied to prevention in specific aspects but they still don’t prove that incidents were actualy prevented. I’m even less a fan of statistical studies across organisations and industries because generally there are too many variables in how the statistics are recorded. There are also too many variables that may not be considered in any statistical study of OHS across organisations and industries – even a change of CEO, Senior Manager, and even government, and their resepctive aproaches to regulation of OHS may affect how a specific business responds thereby impacting on ‘statistical outcomes’. Certainly, for over 20+ years in OHS and applied across multiple organisations and industries, the systematic approach has stood the test of time for me – to the extent that I have been allowed to educate and implement the approach in any given organisation. My focus is always on the organisation I’m currently employed in and the influence I can have there. As I go about my day to day activities I seek to educate and train people at all levels of the organisation to approach safety systematically as I do. My hope is that even if they leave this organisation and go to another, they’ll take and apply my lessons there. But I’m also aware that as they go to another organisation their ability to apply the lessons will be heavily dependent on the ‘culture’ and values of their next employer. Les – I agree that statistics do not ‘prove’ anything. And headline statistics are a comfort blanket that polititicians and regulators cling to with myopic determination. Sole reliance on statistics is deeply flawed. However statistics do give clues as to where to frame questions that might eventually lead to greater understanding of how to reduce fatality and injury rates. For example why consistently around the world have accident ratios changed with minor injuries reducing faster that majors and fatalities to a point where fatality rates are on a plateau – something has changed but we don’t know what it is. It would sure as hell be useful to find out! I think that there is a lot to be said for embracing diversity. Like you Andrew I feel more comfortable in environments where there is robust discussion. Plus, you never know where a new idea may come from. I don’t believe that systematic approaches to managing risk (and safety) necessarily exclude robust discussion. In fact I encourage it whenever I can. BUT uncontrolled implementation of new ideas that have not been clearly thought through and ‘tested’ can, and does, lead to incidents resulting in all levels of injuries. AND if you put yourself in the place of the employer – the law requires that they ensure, so far as is reasobaly practicable, the health and safety of employees and others. IF then an employer is subject to the uncontrolled whims of diverse employees with diverse ideas and levels of capacity to assess risk, with the resulting potential for double jeopardy in the form of penalties for breach of their obligations AS WELL as the resulting costs associated with workers compensation, they are placed in an untenable position. However, a well developed (and compliant) systematic approach to managing safety still requires consultation with affected parties BEFORE change is implemented. This is the stage where robust discussion can be had and provide the opportunity for new ideas to be raised. But it also provides the opportunity for those ideas to be tested and assessed for unacceptable risks beofre anyone is exposed to potential injuries. Les – To avoid my having to write another inflammatory post, I’d value some clarification. Does ‘educate’ mean ‘instruct’ or ‘coach’ ? Is there a difference? Andrew – thanks for the check. You’ve just done what I wish so many of us in OHS would do – ask for clarification of how a term is being used. I’m using the term educate to include instruction, coaching, mentoring and in some cases training. ‘train’ as being: to apply knowledge through development of skills. Both rely on a knowledge component but training incorporates application of knowledge through activity. When I use the term ‘educate’ I’m meaning to include all of those aspects of improving knowledge and skills. In some cases it’s provision of new, or correction of currently held, knowledge. Eg: I had a conversation with a site manager the other day who was of the understanding that ‘ladders are unsafe and we are not to climb them’. In some cases it is to demonstrate a particular skill and then coach them to apply that skill themselves. Eg: I have recently been working to ‘educate’ some of our work teams in understanding the difference between Safe Operating Procedures and Safe Work Procedures and then how to develop both following a risk management (task risk analysis) approach. Sometimes education takes place in formal settings, using tried and true ‘teaching’ or ‘training’ methods and sometimes it takes place in the form of a conversation and/or on-the-job demonstration. I’m a great believer in the ‘apprenticeship’ approach to education – watch me do it, help me do it, show me you can do it. So, as you see, there is a complex amount of information wrapped up in the one word ‘educate’ as I use it. Les – Thanks for this; we are on common ground. The number of times I have heard site managers say ‘bring back traditional apprenticeships’ are beyond count. If I remember you earlier posts correctly you are a ‘man off the tools’ so you have the experience to show men better ways of doing things. I believe that respect for the man with ‘intelligence in his hands’ is a better way of motivating him than fear of the law but I might be a voice in the wilderness. What do you think? Andrew – I agree with you whole heartedly. And I hope we’re not in the wilderness together. Although often I think i’m doing a lot of ‘weeding’ to bring clarity to the scene. I believe that many managers are ill-equipped to provide training for their subordinates. In fact many of them are ill-equipped to do their own job. In some cases this is because we ‘promote’ someone who was good at their job in one level but fail to recognise that the job we promote them to requires an entirely different skill set. I went through it myself – I was a very competent leading hand fitter with good diagnostic skills. Promoted to a supervisor role I was better able to apply those diagnostic skills whilst also exercising more leadership. But just 9 months later my next promotion to ‘superintendent’ left me struggling even to understand what skill set I needed. That was when I undertook higher education and did a Bachelor’s degree in Commerce – Employment Relations. But many who are promoted in similar ways don’t recongise the need for, or want to invest in, their own development. And their managers, who had to sink or swim themselves, don’t know how to provide the necessary training to upskill them. With regard to safety, I acknowledge that we need to be able to demonstrate compliance with the laws – in case something goes radically wrong and a prosecution follows. But I believe that we need to encourage individuals and teams to see that safety is it’s own reward and that it makes good business sense to find a safe way to do work. I’m also a great believer in ‘there’s more than one way to skin a cat’. So discussion and ideas sharing is an important part of how I ‘educate’. Because I have well developed research skills, I can often find ‘better’ (safer) ways to approach a specific issue but I certainly don’t have all the answers. And I can’t always see if my way will work in a particular context so I encourage discussion with a view to achieving consensus (not a democratic vote) that a certain ‘control’ (or solution) will be accepted. ‘Ownership’ of a solution is the best way to ensure compliance to use that solution. And I love it when my approach switches lights on for people and they start to develop a broader approach to finding controls or solutions. Getting them to ‘think outside the box’ is not an easy task when they come with preset ideas – often taught by my (ill-equipped) predecessors. Les – I have just looked up ‘AFFORD’ on google. If you work with people with disabilities you are either a ‘do gooder’ or are very empathetic – almost certainly the latter. Where statistical research breaks down is that there are no metrics for ’empathy’ or ’emotional intelligence’ yet I know from experience that managers who have both end up with happier, safer and more productive workplaces! Andrew – as you’ve probably worked out, AFFORD is a not-for-profit government funded organisation that provides a range of services to people with disabilites. Whilst I have some casual interaction with our clients in various contexts, my role is to provide advice and guidance to the entire organisation but primarily focussing on safety of staff and employees with disabilities and in realtion to workers compensation claims and return to work. Within this broad role I am charged with responsibiilty to ensure our Work Health and Safety Management System (WHSMS) is compliant with applicable prevailing legidlation and regulation. My job here is made relatively easy due to the high focus for safety of clients who are unable to take responsibility for their own safety. But within that is the addedd issue of staff who have a tendency to place themselves at risk whilst seeking to care for their clients. Compliance with legislative and regulatory standards are not much of an issue. But ‘educating’ staff in recognising and assessing risks and then making good choices between conflicting risks is having a good outcome with significantly reduced frequency of incidents and severity of outcomes.